Jubilee Debt Campaign is today launching a briefing with 43 regional organisations and networks on the need for new mandatory rules to ensure lenders disclose information on loans to governments. The briefing is being released ahead of the IMF and World Bank Spring Meetings (9-13 April) and G20 Finance Ministers meeting (8-9 June, Japan) during which ways to increase transparency of loans to governments will be discussed. The briefing is titled ‘Transparency of loans to governments: The public’s right to know about their debts‘. The organisations launching the briefing include Christian Aid, Global Witness, ONE Campaign, ActionAid International and Islamic Relief, as well as the global union federation Public Services International and the regional networks Afrodad (African Forum and Network on Debt and Development), Latindadd (Latin American Network on Debt, Development and Rights), APMDD (Asian Peoples’ Movement on Debt and Development), Arab NGO Network for Development (ANND), Jubilee Caribbean and Eurodad (European Network on Debt and Development). 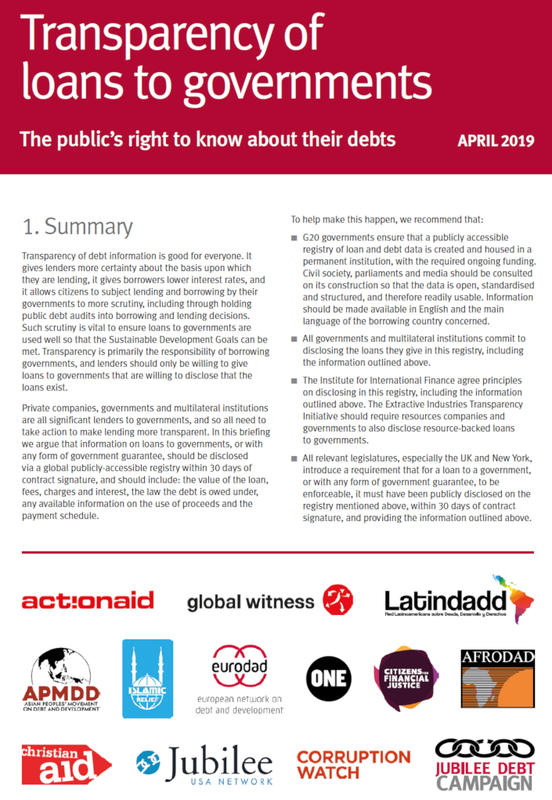 Other signatories include national civil society organisations which try to hold governments and lenders to account for how loans are spent, including the Budget Monitoring Forum in Mozambique, Budget Advocacy Network in Sierra Leone and Jesuit Centre for Theological Reflection in Zambia. You can read the four-page briefing here.